I began playing in 1977. I’d learned wargaming from my older brothers, and classmates introduced me first to the microgames Melee and Wizard and then to D&D. I began writing for publication in 1994. The game store I went to in the ’70s and early ’80s, Book Village in Pasadena, California, carried fanzines and amateur press associations along with professional books. So I started reading Alarums & Excursions right off. A fair number of the people who went on to create interesting games of the ’80s and ’90s joined over the years: Robin Laws, when he was a video store clerk and wrote these fascinating long movie reviews; Jonathan Tweet, when he was a college student; Rob Heinsoo, ditto; and so on. Robin and Rob made connections with Jose Garcia as he was starting up Daedalus Entertainment and worked with him on Nexus: The Infinite City. They in turn invited me along with others to contribute to it, and one thing led to another from there. Where do you find your inspiration? How do you keep your ideas fresh? Inspiration comes from…everywhere, more or less. A lot of my best material comes from weird real stuff, which is why I encourage gamers, both fans and pros, to read and watch widely in factual material: documentaries, nature shows, history, biography, science, social studies, a bit of this, that, and the other. It’s not uncommon for me to end up mixing together an image from a science fiction novel, a style of costuming or symbolism in some obscure film, and a historical tidbit about low-tech manufacturing, or something like that. Freshness comes from two things: gaming myself, and learning more about the world. Learn to write well. Almost all gaming writers deal with the same basic problems: too-complex sentences, passive voice, and general awkwardness that comes from trying to sound too erudite. Most of us would like to write like Jack Vance or Gabriel Garcia Marquez, but we’re better off aiming for elegance in simplicity. Don’t try to make a full-time job of it. It’s possible, but extremely hard to make a real living at it, and after a few years of it, it’s terribly easy to end up burned out and bitter about the whole thing. If you keep it as an avocation that enriches your life one or a few times a year, on the other hand, it can add more than it takes away. Get prepared to deal with flakes and jerks. Many of your colleagues in the business will be horribly, wretchedly unprofessional. A noisy few of the fans will be rude and worse to you. On the other hand, some folks will be great. Don’t lose your love for the venture in doomed efforts to persuade those who would rather be miserable – focus on those who show interest and a willingness to learn and grow. Don’t let others load you up with a lot of guff about your obligation to cater to their obsessions and hobby horses; do what you contracted to do for the job, and what you want to do when interacting with the public, and nothing else. Keep it fun. Hmm. That’s a tough one. I think I’d pick Judgment Day, the Time of Judgment novel for Mage: The Ascension, just because it occupies a unique place. Nobody else will come along later to address anything I may have left out. A good runner-up might be my part of Final Frontiers, the never-published Last Unicorn Games book covering the movies era for their Star Trek line. Elizabeth Brooks, Clayton Oliver, and I did overlapping work covering Starfleet, Earth, and the Federation, and worked very very hard to have it all make sense while fitting the evidence on screen. Fun stuff, and I’m very sorry it never saw the light of day. This is also tough, but for happier reasons, since there’s a lot that I’m pleased with. World of Darkness: Blood and Silk exists because I kept bugging Rich Dansky about a Silk Road book for Vampire: The Dark Ages or Kindred of the East, and eventually I got a chance to put my college studies in Chinese history to use. Dark Ages: Vampire gave me the opportunity to draw together everything I’d learned about Storyteller character creation and make it more overt and accessible to players, and I keep hearing compliments about that. Adventure was a thorough riot and delight. Wraith: The Great War inspired a fair number of players to go learn more about the subject in real life. I could go on like that for some time, come to think of it. What differences/challenges do you face when writing an RPG novel versus a sourcebook? In some ways they’re direct opposites. A sourcebook is a collection of tools, including starting points, that’s supposed to lack finality. The whole point of it is that the players bring their own development and conclusions to bear. We help them get started, and the rest is up to them. (That’s true even of the Time of Judgment books, which lay out frameworks but still leave the crucial front-and-center spotlight for the player characters.) A good sourcebook multiplies possibilities rather than closing them off. A novel, on the other hand, is precisely one of the many possibilities, with an end along with the beginning and middle. I like both kinds of writing. What’s it like being the one to write the last of the Mage: the Ascension fiction? Complex. I’m very pleased with how my book turned out – with excellent advice during planning from both Bill Bridges and Phil Boulle, and with the usual outstanding developmental help from Phil, I must note. I enjoyed working again with a character I invented, and got to ride a bunch of my hobby horses about how I think Mage should work, and that’s all fun. On the other hand, a significant part of the fun in writing for an ongoing game line is seeing what others do with your work, and of course that’s not an option here. It’s hard to wave goodbye to something I’ve invested so much thought and emotion into over the years. On the other other hand, it’s great to have actual closure as opposed to the line getting cancelled and just drifting off into the void. I could go on with other hands for some time about this one, too. What differences/challenges are there in becoming a game developer vs an author? It’s sort of like playing in an orchestra versus being the conductor. As an author, I contribute to the overall plan and may get to do some extended solos if I’m one of the featured performers, and I may get a lot of input in rehearsal, but I’m very much part of the group. As a developer, at least for an established company like White Wolf, I’m still accountable to my superiors, subject to direction and review, but I have a much freer hand to choose what we’ll perform and how we’ll do it. I may, depending on circumstances, also sit down at the piano to play along, but mostly I’m coordinating and directing the work of others. I like both roles a lot. These days I’m mostly conducting, and I like being the boss, but it’s not so much “better than” writing as just plain “different from”. You’ve written material for most of the World of Darkness lines (Vampire, KotE, Dark Ages, Wraith, Mage) do you have a favorite? Why or why not? Well, Wraith is what opened up the WoD to me, and I’m particularly sympathetic to the themes of loss and resolution because of my long-term disabilities. I’m also fascinated by Kindred of the East, partly because of an interest in Chinese culture running back to college and partly because I find the “you died, went to Hell, and escaped” origin extremely rich in potential. I like all of them, but I think those are my favorites, with all the rest very closely packed together. You’ve also written material for Mind’s Eye Theatre; what makes for a good LARP? A solid hook, to tie things together with a clear attitude and focus, enforced by Storytellers willing to say “no” to stuff that doesn’t fit and “yes” to stuff that’s great and suitable even if it wasn’t part of their plans. Players willing to do a little thought and adjust details to fit smoothly with other aspects of the game, and willing to separate their out-of-character concerns from the issues that matter to the character. Cooperation and good will all around. 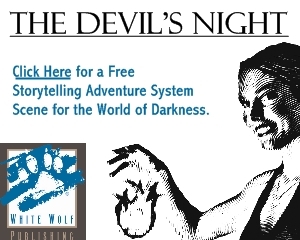 If you could have written one more World of Darkness book before Time of Judgment, what would it have been? Hmm. Any of these: a Convention book for Mage (the Syndicate or Progenitors, by preference), a KotE book on non-Asian characters drawing the Second Breath (this would push the cosmology a bit, but I’d come up with several ways it could happen), a cross-line/general WoD book on strangeness not associated with any specific line, like cryptozoology. I’ve run some 1PG for friends, and am playing in a Mutants & Masterminds game testing out concepts for a Superlink supplement one of my friends is working on. Dark Ages: Vampire and Feng Shui are on the list, along with playtest for upcoming projects. Both, really. 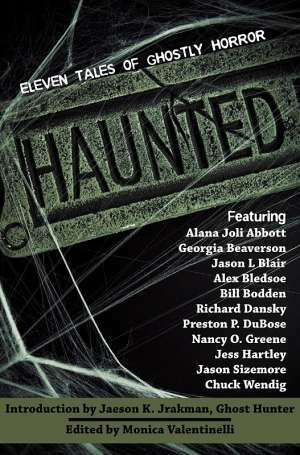 Horror is a genre and a publishing category and an attitude and quite possibly a floor wax and a dessert topping. Chuck Palahniuk’s novels like Lullaby and Diary are horror stories just as much as Stephen King’s or Peter Straub’s, even though they’re not marketed that way. Brian Stableford’s Werewolves of London trilogy may not be horror at all despite being marketed that way. Some great stories can be read as horror or as something else, with productive results either way. This is awfully vague and wishy-washy, isn’t it? I guess I think of horror as something that can surface in combination with almost anything. When it’s done well, it’s like great seasonings in cooking: distinct in itself, and enhancing the distinctiveness of the rest. It can take center stage, or grace a work that’s primarily something else. Horror as an outlook or mood is older than horror as a genre, but both are well-established now and I don’t think one is any more real or fundamental than the other – my oldest brother is a full decade older than me, but I don’t become less grown up when I mention him. The evocation of something mysterious and strange, but in concrete enough terms that players can actually interact with it. The opportunity to face a mystery in the midst of what has seemed predictable and safe. More gaming work, both some short self-published projects and some longer work for others. Announcements will be coming on those. I’ll also be working on fiction, with short stories and novels starting to make the rounds later this year. For more information on Bruce Baugh visit his website at http://homepage.mac.com/bbaugh/iblog/.